The world around us, all too familiar, is not as it seems folks. Upon transcendence of our beastly realm, that illusion is swiftly shattered. Our modern scientific nous, centuries of intellectual giants leaping on top of the shoulders of their revolutionary predecessors, tells us this. Let us zoom out in scale, to buildings, streets. Again, and again, through cities, oceans, continents, the entire Earth. Oh, and again, and a wee bit more. Go on, keep on going. Carry on. No, not there yet mate, a bit more please. On you go, there’s more to go. Yes more still, and more, and then some, until… Well, until your brain is close to exploding in discomfort at your insignificance. I think we are here now. Oh the vastness! We are infinitesimally tiny, as we zoom from the human perspective, to planets, to solar systems, to galaxies, each one containing one hundred thousand million (!!!) stars, each potentially with their own solar systems. 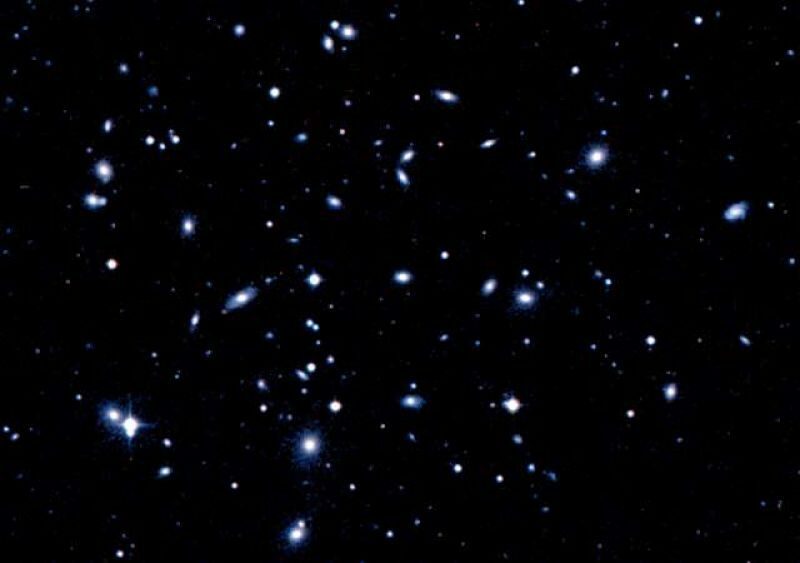 Super clusters, then, contain tens of thousands of these galaxies… I hope it makes all your worries and travails seem pretty silly: perspective, innit! Was that the sound of your brain exploding? Sorry, call 999 if you are from the United Kingdom of ‘Brexit will make it all better’ or 911 if you are from Trumpistan (not sure what you dial if you are in Moldova, sorry). Now let’s zoom in, back to human scale. I can’t be bothered with the carry on above, so yeah, go on, again and again etc. Good, there yet? No, well carry on. Fantastic. Now we are back on terra firma, let’s carry on zooming shall we. Are you awestruck as we zip past dancing molecules, down to atoms. Further and further we go, exposing the atomic structure: shimmery porous clouds of electrons that go on for ever, and ever, revealing dense, tiny nuclei way down below made up of neutrons and protons. Further in we go, denuding these subatomic particles to see a whole zoo of particles underneath: various quarks, neutrinos and photons. By now, dear reader, you are no doubt aware of my tangential ways, my random meanderings, but you’ve trusted me and I am sure you agree, we normally get somewhere. You are probably fairly perplexed right now, not sure where I am going with this, and probably slightly irked at having your brain both exploded, then summarily imploded within the space of a few paragraphs. And where’s the recipe? Ok, I’ll stop. All this zooming out and in has made me, frankly dizzy and reaching for the ibuprofen too (and I knew it was coming!). If you were really to have embarked on this grand Brobdingnagian and Lilliputian adventure, you would have noticed that at every scale, there was a hell of a lot of nothing hanging around. Yes, nothing. Nada, sweet FA, diddly. And this is the crux of my ramblings today. As humans we don’t think about it, but nothing is very important, and in the universe there seems to be a load more nothing then thing. The big bang took us from nothing, and loads of it is still out there, peppered with occasional thingi-ness (a technical term). The universe is allegedly 95% dark matter which I don’t profess to understand, and not sure if it quite counts as nothing. Certainly, at the subatomic level, for example, we see that what we perceive as being solid is anything but, given we have swathes of empty space, punctuated by clouds of electrons and tiny, tiny nuclei. In the culinary world, nothing can be extremely important too. The more astute of you would counter that that space in our food tends to be air or carbon dioxide and yes, you would be correct, smart arse. Given we don’t eat or digest air, for the purposes of our discussion, we can think of these foods as having lots of emptiness within, which is vital to the success of that dish. Think breads, cakes, pastries, soufflés, meringues, mousses. Plenty of air, or lack of it is the difference between a delightful loaf or cake, or a dense, unpalatable brick, only useful as a doorstop. We imbue our food with these air bubbles by various means. Long, long before the scientific method, Man unwittingly observed various biological and chemical phenomena. With practice we were able to learn how to get consistent and reproducible results in order to create the joy of feather-light, spongy goodness! For example, bread, made the old fashioned way, must have appeared like magic. The first leavened bread would have been discovered by accident. A gruel of water and wheat (the basic stuff of unleavened bread), left for long enough attracts natural airborne yeast. They make their home there, feed on the sugars in the wheat and then excrete carbon dioxide which produce bubbles in the bread (a process known as fermentation), leading to lighter, airier, leavened bread! My recipe today is very much in beta. I took a well known recipe from the Gujarat, in West India, one of my favourite teatime treats, and have created a western take on it. So, India’s venerated steamed dhokla becomes a chickpea cake. In the Mediterranean, gram (chickpea) flour is already used in, for example, Nice’s socca, or chickpea pancake, or the Sicilian panella, chickpea fritters. I think chickpea flour is a fantastic ingredient: naturally gluten free, high in protein and vegetarian. This recipe is here, but it is currently a fail. Yes, in time honoured tradition of the soufflé, I failed to get enough nothingness into this dish, mostly due to my eagerness to take a peek before I should have done. Upon said peek I saw a glimpse of perfection. I saw a proud cake: risen, light, fluffy, puffing its chest out in delight, shouting, look at me, look at me, look at me! Alas, it was there for but a fleeting moment, like some exotic particle in a particle accelerator. To carry on my Physics metaphor, this was, if you will, Schrodinger’s cake. The act of the observer did in fact affect the outcome. I know that the likes of Ottolenghi would never post a failed beta recipe, but I don’t have a scores of people running around testing my recipes with hundreds of ingredients, so you will have to make do! I must confess, I think the dish works pretty well: the chickpeas, parmesan and herbs are a great match for each other, and I am sure it will be even better lighter and airier. I think that the tarragon (use the French variety), is a particularly delicious flavour in here. Traditionally, dhokla becomes light and airy through fermentation, by leaving the mixture out to naturally ferment. There is an ‘instant’ version, where Eno fruit salts react with the lemon juice (or citric acid) and immediately bubble up: we are going to use this method here. Where the Indian version has ginger and green chilli, the western flavour profile is parmesan and herbs which marries so well with the chickpea flour! 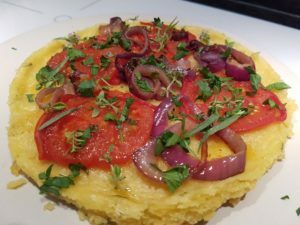 Where the Indian version has a tempering of black mustard seeds, curry leaves and more green chilli, I have ‘tempered’ sliced tomatoes and red onions to be placed on top of the steamed cake to give it a bit of soul, then garnished with more herbs. NOTE: You can buy Eno fruit salts in your local pharmacy. This recipe requires us to get steaming the second we add the fruit salts to the mixture, so first things first: get a steamer going on your hob, and ensure you have started the water heating. I add water to a wok, place a bamboo steamer on top, and the cake tin sits in the steamer. Heat on a medium heat so that the water is on a rolling boil. This is a merely a suggestion: use whatever works for you. In a bowl, mix all the cake ingredients, except for the Eno. Whisk well to incorporate some air into the mixture. Note, I missed out the lemon in the pics below, but it is essential to get the right chemistry, effervescence, wit and repartie! Take a cake tin and give it a layer of olive oil, to ensure we can easily remove the cake. Ensure our steamer is ready and hot. Now add the Eno to the gram flour mixture. With a whisk stir it in the same direction for about a minute: it should immediately expand with bubbles and look light and airy. It should have a dropping consistency of double cream. Pour the mixture into the cake tin, place the cake tin in the steamer, close and leave for a good 20 minutes. Please don’t do what I did and sneak a peek: have patience, faith and ye shall be rewarded! Meanwhile, whilst the cake is steaming, lets create the topping! In a saucepan, add a tablespoon or two of olive oil and heat. Now add the sliced tomatoes and onions, and cook them down until nice and browned and tasty, for about 10 minutes. Leave aside. Once the cake is steamed, and hopefully risen, remove it from the cake tin, then add the topping and herbs. Make sure you add the flavoured oil from the saucepan, as there is some good flavour there! There you have it, my fusion Parmesan and Herb Chickpea cake – Phokla. I hope you enjoy it!